We’re dedicated to developing online workouts and communities for people with specific health conditions and cystic fibrosis is a particularly important focus for us. In case you didn’t know, one of Pactster's Co-Founders, Pamela, is a cystic fibrosis physiotherapist as well as a qualified yoga instructor, so we’re clued up on how crucial exercise is in the management of CF. We have created specialist workouts for the CF community, lead by CF physios and fitness professionals who have CF themselves. We have everything from HIIT to get your lungs working to yoga that can help to relieve ‘CF Belly’. Of course, we’re always keen for your input too, so that we can learn what would improve exercise for you. The other great thing about Pactster is that you can join our ‘communities’ and take scheduled workouts with other people with cystic fibrosis and CF physiotherapists, free from the risk of cross-infection. Alternatively, you can workout by yourself, wherever and whenever you fancy, or join a ‘buddy’ via video chat. 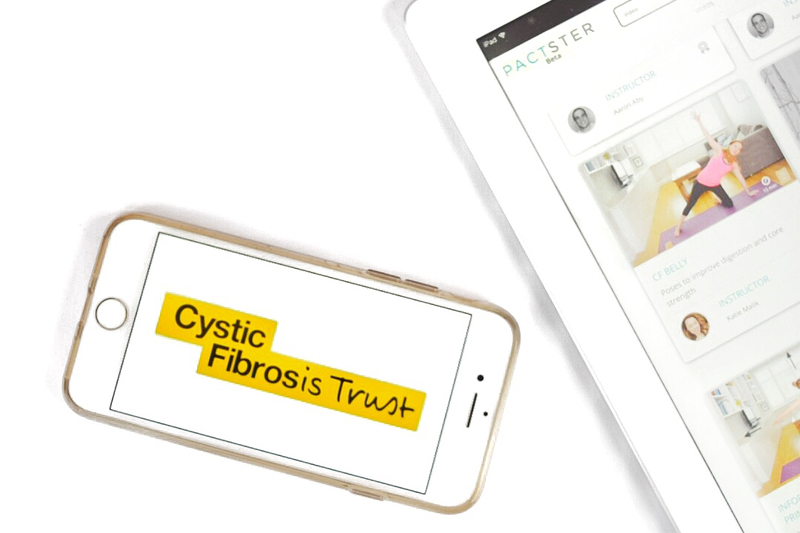 If you qualify for free access to Pactster via the Cystic Fibrosis Trust, simply follow the sign up process that starts with clicking the start button on the top right corner of the Pactster homepage. Input your details and be sure to select that you’re interested in ‘Cystic Fibrosis’. From here, you’ll be directed to a form that will enable you to select your CF centre and gain a free subscription to Pactster through the CF Trust. If you’ve already signed up but need to switch to this free subscription, cancel your existing subscription (by going to your dashboard, and ‘account info’) and then register your eligibility for your free subscription here. Once you’re signed up, you can browse videos relevant to Cystic Fibrosis and complete the workouts you feel you’d benefit from most. You can also browse videos under other categories: perhaps you’re a CFer who loves running or is postnatal? We're also in the process of developing new videos focusing on families and children, as well as people with more advanced disease including pre- and post-transplant. We'd love your input so please let us know what you;'d like to see more of. You can also check out our Pactster communities and join any that are relevant to you. Or perhaps you’d like to chat to us about starting your own? Drop us an email at hello@pactster.com if so. Within communities, you will find ‘scheduled workouts’ that you can join along with others in that community. These workouts will auto-play at the scheduled time and you’ll be able to talk with others using the chat box. We love communities, it’s a great way to form a ‘pact’ with others and improve your commitment to exercising. You can check back at your communities for updates at any time. The communities you’ve joined are also stored in your individual dashboard. And while at your dashboard, how about you add some buddies? Finally, if you have CF, we’d love for you to join us in our Facebook Group - ‘Exercise for Cystic Fibrosis - Pactster’. It’s a closed group where you can freely discuss exercising with CF without judgement. You can feed back on your Pactster experience to help us make improvements, ask questions to the team, share any changes that you’re experiencing as a result of exercising with us, and get advice from our specialists in a safe environment. You can also follow us on Twitter @Pactster and @Pactster_CF, on Instagram, and like our Facebook page for updates. While Pactster is not currently free for people with CF outside the UK, the team at Pactster are on a mission to better the lives of people with CF all over the world and hope to be able to make it free for everyone, everywhere, in the near future.